Look how cute these unicorn lip balm holders look - perfect for your school bag, handbag, pencil case. 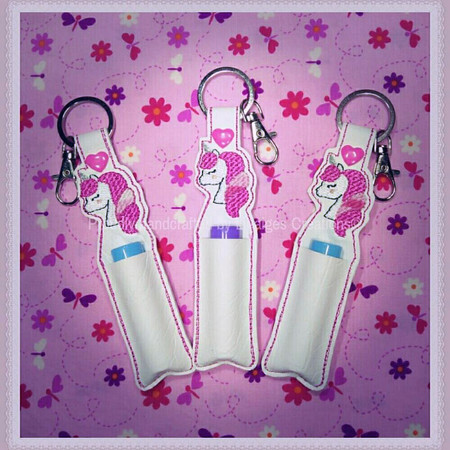 ***Price is for 1 unicorn lip balm holder/ key ring/ bag tag with lip balm flavour of your choice*** Happy to combine postage, please message me to discuss further. Comes with your choice of lip balm. Lip balm flavours include watermelon, tropical, pineapple, grape, strawberry, orange and cotton candy. Please include the flavour you would like when confirming your purchase. Constructed from 2.5 layers of vinyl with a layer of felt. The snaps can be clipped or threaded on to keys, school backpacks, bags, zipper pulls etc.